It’s ok, I’m not about to post a recipe for crispy cakes as they’re not exactly hard to make are they? 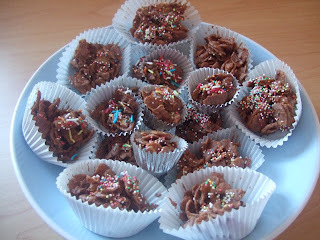 I just wanted to show you the crispy cakes that Miss Frugal made herself for her birthday party last week. We used about some frosties and a huge block of Tescos own brand chocolate (not the value one but the next one up) and sprinkled some sprinkles on them before the chocolate set again.